Flexify 2 - Amazing Plugin! Want to turn a picture of your kids into a cube, print your photos with origami folds, or make your house look as if it is reflected in a mirrored sphere? These are just a few things you can do with Flexify! With Flexify you can bend spherical panoramas into vertiginous new shapes. Make hyper-wide-angle views, print panoramas and maps as foldable solids and 'globe gores', simulate impossible lenses, and much more. Bend spherical panoramas into vertiginous new shapes. 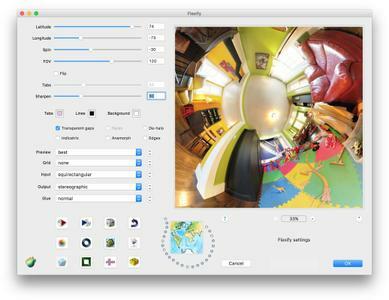 ﻿﻿Flexify 2 - Photoshop plug-in for panoramas, polyhedra, and maps. Bend spherical panoramas into dizzying new shapes. With HDR support, stereographic little planets, cube maps, cartography, polyhedra, and zenith/nadir retouching formats.